This is kind of the Elvis hairstyle with a touch of extreme. I just wonder how long it takes him to do this every morning. Anyways, it gotta be super cool to walk around with such a hairstyle. This is definitely a hairstyle with a purpose. One that will shield you from the sun during that sunny day.If everyone got this hairstyle, it will be a matter of time before the cap business goes out of business…lol. It’s kinda creative..don’t you think??? 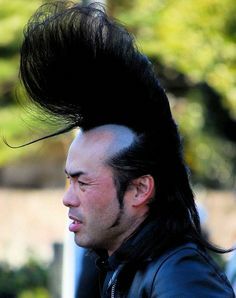 This hairstyle emerged from Osaka, Japan. As you can see, this looks like a tomato. 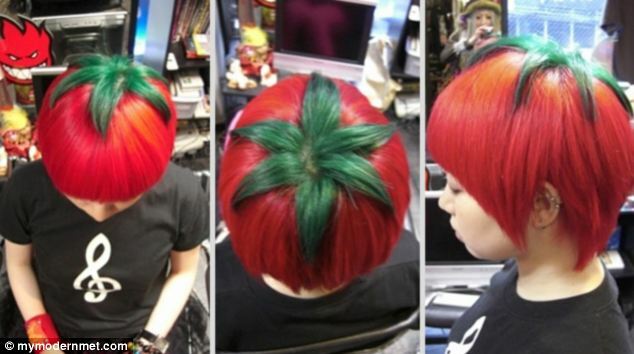 However, I think they should have added a few dots to turn it into a strawberry…#Yummyhair. 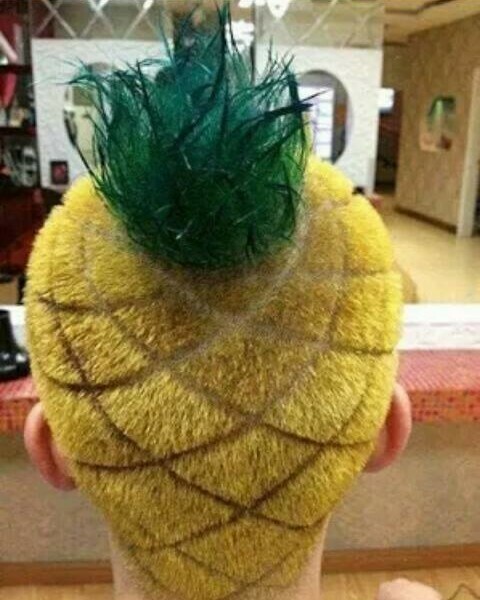 Since we are already talking about fruit inspired hairstyles, why not just include this beauty. Doesn’t it just make you want to go to the grocery store and buy fruits…it’s kinda making me hungry for fruits. #anyone-thinking-the-same??? I love this hairstyle. It just screams ‘like me’. 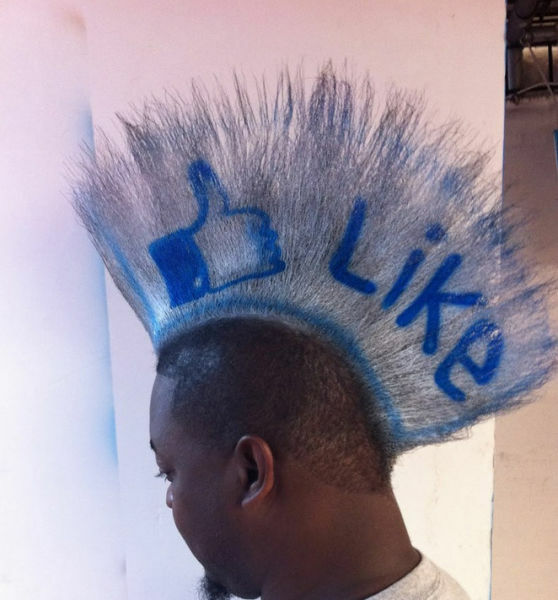 Another creative hairstyle that deserves a thumbs up! See what I just did there..thumbs up=like..lol (haha…sorry for the dry comedy). Remember when you were in that class, and you were so bored and sleepy that you often placed your open textbook in-front of your face to make it seem like you were reading/paying attention; while in reality, you were probably dozing off. We all have tried a trick or two while in class…you know it’s not only me. Anyways, gone are those days. 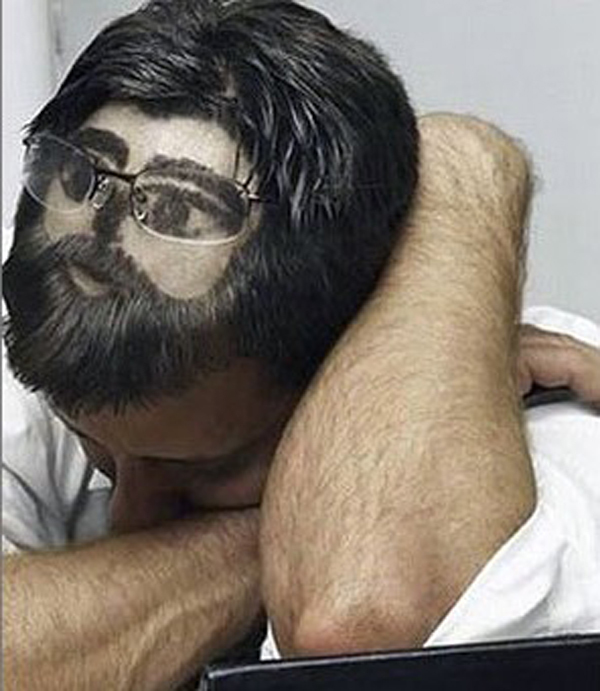 This haircut is the solution..Guaranteed…but don’t get caught! This is a trend started by Japanese top-star Shoko Nakagawa. 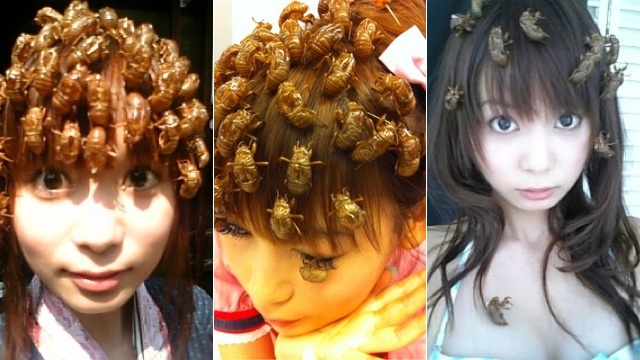 Apparently, during the summer, some fans put cicada husks on their hair…don’t really know the real purpose for this. It’s kinda strange, yet yummy if you’re into bugs. I need to up my wierd game!